I can’t ask for a better mystery to read on the weekend, than one by Gayle. Gayle never leaves a reader hanging she leaves them wanting more from this series. This book has strong characters that are easy to love (especially Homer with his hero of the day quotes), lots of details to hook the reader, and the development of a nice smooth ride until we hit the finale upset because it is the last page. I do believe I am falling in love with this series . 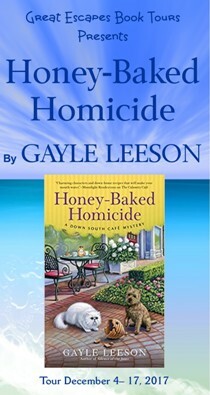 . .
HONEY-BAKED HOMICIDE, the third book in Gayle Leeson’s Down South Café Mystery series is an entertaining read that combines both a twisty-turvey murder plot along with a cornucopia of colorful characters. This book leads you on one great ride. Can’t wait to see what is next! I can’t say enough how much I love this cozy mystery series. In fact, the Down South Cafe books are one of my go-to series in this genre. They are clean, entertaining, well-plotted and full of yummy food. 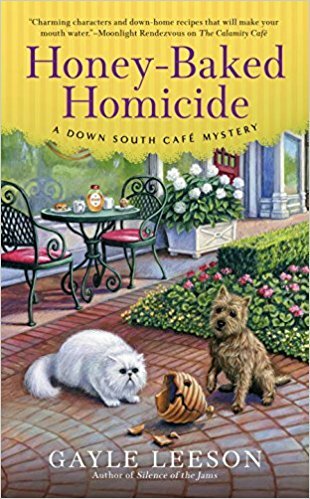 With Honey-Baked Homicide, Gayle Leeson adds another volume to one of my favorite cozy mystery series, consistently delivering on stories that entertain, have good character depth, and are totally clean. Amy is one of my favorite heroines because of everything that she went through to realize her dream of owning her own cafe and I love her personality. I really enjoyed this book. The plot was interesting and kept my attention and the murder mystery left me stumped. 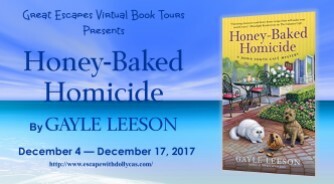 Honey-Baked Homicide is a good read–a setting that works well, interesting and engaging characters, and a mystery that I didn’t solve until the end. I enjoyed the story, and didn’t feel like it was odd that the main character was investigating the crime–she had a good reason to care and wasn’t really treading on the toes of the police. A delightful and charming read. Honey Baked Homicide is a keeper. I really like Amy, as she isn’t the type of cozy heroine that wanders into trouble for the sake of solving the mystery. I really enjoy these books because it seems like I can never figure out the killer. . . We give this 5 paws up. This was another well-written story from Gayle Leeson. The plot was well thought out and believable. This one kept me guessing and the ending is a total surprise. This is the third book in the series, and each one has been more exciting than the last. The book is full of suspense with twists and turns around every corner. There are so many suspects, from within the town and from other cities, to choose from. The author does a great job disguising the murderer and the motive along with everything else related to the mystery. HONEY-BAKED HOMICIDE induces lots of heart-stopping moments as Amy deals with some new characters while discovering the past Mr. Landon tried to leave behind and the future of Winter Garden itself. That poor beekeeper! Beekeepers are having a tough time as it is! What beautiful dog. What breed is your dog? What a great plot! I may have to delve further!!! I’m really looking forward to this series! Congratulations on the release. I hope it a big success. I want to visit Winter Garden & all it’s quirky residents. Thank you for the giveaway! This book sounds like an excellent addition to the series. Thanks for the tour & giveaway. New to me author. This book sounds so good! I can’t wait to read! Thank you for sharing and having this great giveaway! Sounds Awesome, Love The dog. and author Gayle Leeson.. I want very much to read this book! The book sounds like fun to read. 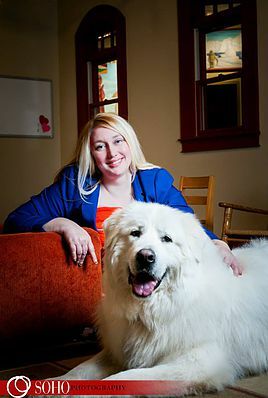 Beautiful white dog.